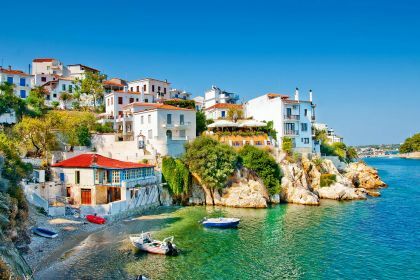 The most popular island in the Sporades group, Skiathos is a heady mix of pine-covered hills, turquoise waters and a throbbing nightlife. 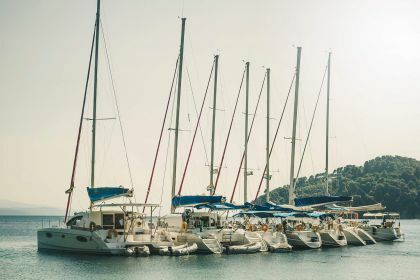 While it gets busy in summer, with groups of partying youngsters on holiday, life on board a yacht can be as tranquil or lively as you want it. With over 60 beaches to choose from and numerous coves and capes, you’re guaranteed to find a perfect spot to drop anchor. Lalaria Beach, only accessible by boat, has spectacular white cliffs rising out of the turquoise waters, sea caves and a beautiful sandy beach. For a fun day out, head to Koukounaries Beach, where the beach bars do a roaring trade, the crystal-clear waters are inviting and the people-watching available in all shapes and forms! The crystalline waters make Skiathos an excellent place for snorkelling, swimming and scuba-diving. Diving excursions can be organised through Dolphin Diving Centre. The island is a mountain biker’s dream – particularly the wilder northern side, where one of the numerous trails can be combined with refreshing sea swims. The 18th-century Evangelistria monastery, about five kilometres out of Skiathos Town, is a stunning stone building with commanding views of the sea. 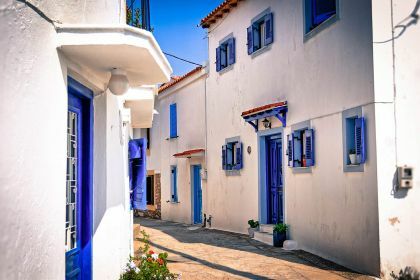 Shopping in Skiathos offers some unusual items, including hand-made jewellery and pottery from the Blue House Art Gallery in the main town and contemporary décor from Saita Skiathos. 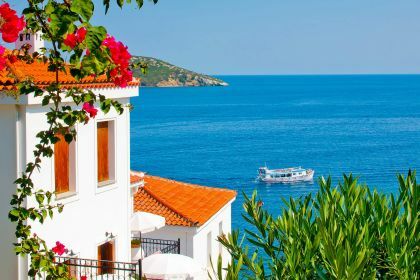 You’ll be spoilt for choice in Skiathos as the island is packed with restaurants, cafes and bars. Lo&La, at the top of some steep steps, has the most spectacular views of the bay and old harbour. Time your visit with a full moon, tuck into a plate of squid-ink pasta with octopus and lobster, and you’ll remember this moment forever. The Final Step, also overlooking Skiathos bay, serves modern Mediterranean dishes, including crisp salads and fresh seafood such a sesame-encrusted salmon. For tavern lovers, Taverna Selini is a laid-back spot specialising in local seafood dishes. 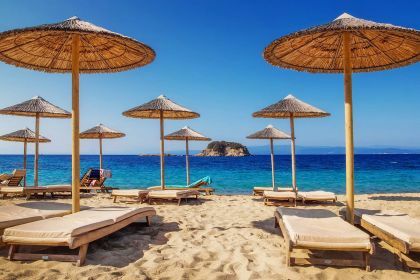 Skiathos is known for its vibrant nightlife, so you can either party down at one of the many beach clubs or find a quiet spot for a cocktail. The open-air cinema in Skiathos town is a romantic way to spend an evening under the stars, sipping wine while watching a variety of movies. Up for some dancing? Then stylish Jaguar, on the promenade in the old port, is a fantastic place for a cocktail or two and some boogying. Funky Rock n Roll Bar serves a range of excellent cocktails and has sublimely comfortable seating on plump cushions as well as great harbour views. 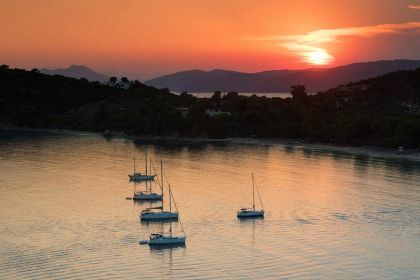 For a perfect yachting holiday to Skiathos and surrounds, contact our friendly broker, call us or leave a message using the contact form. Insider Tip: If you’re thinking of renting a car to explore the island’s interior, opt for a 4X4 as some of the dirt roads are fairly rugged.